The standard MersenneTwister function from the Java library is used as a random number generator (RNG) that underlies the algorithm for generating combinations in Chain's Code. The input for this function is the SEED key and the end-to-end sequence of numbers (Number Sequence). 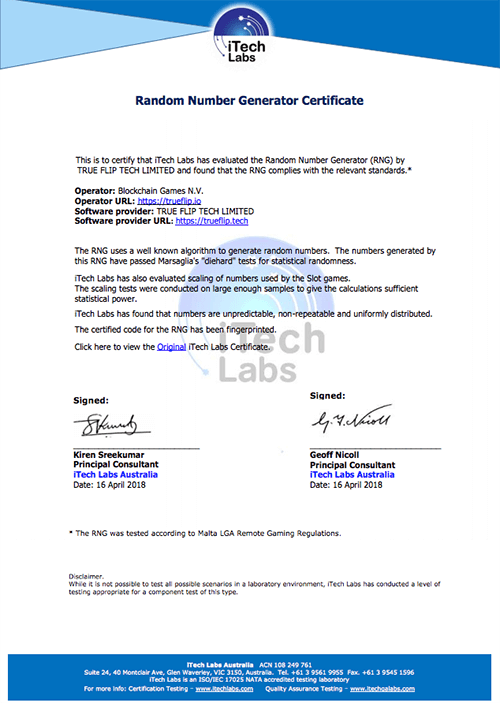 MersenneTwister is a trusted mechanism proved itself as an efficient and reliable random number generator recognized and approved by international certifying organizations. Is a 19-digit random number and a private key generated using the RSA cryptosystem. This key is updated and published on the website every 30 minutes. In the process of generating numbers for the current and actual rates SEED is hidden from the user under asterisks to protect against guessing the combination and opens immediately after a new key is generated. Player 1 launched the game and was the first to do so under the new SEED. For him was generated the following NS: 0,1,2,3,4,5. After the game start Player 2 has generated NS: 6,7,8,9,10,11. The one who starts the game third, respectively, will use NS: 12,13,14,15,16,17. And so on until the next SEED key is generated. MersenneTwister function with the current SEED is used to determine the game combination of digits. The request is send six times in the number sequence order, where NS is a sequential number of requests to the MersenneTwister function. The result of these requests to the function is the final combination of digits. Where do I find SEED, Number Sequence, and how do I check my game? Any user can find SEED and Number Sequence values used for generating the combinations of his games in the table of his bets archive. You can also make use of a special tool to check the results of your game. Go to Play and open My bets, and then Archivetab. Here you can find the history all your bets divided by sections of the SEED number. The system will automatically fill SEED values and NS into the check form. Click on Run button to emulate MersenneTwister function and check the transparency of your game results. To check the output of the standard MersenneTwister function and, accordingly, the results of your game, you can refer to any third-party services using the following inputs: SEED, Number Sequence and NextLong(8) – an algorithm inside MersenneTwister.